If you have been visiting this website, you have probably figured out by now that I simply love the industrial, rustic, warehouse type decor! I worked for my sister, who is an electrician for a number of years and loved the many old retro light fittings she would rewire to make them safe and up to code (Remember always do this or purchase modern yet old looking pieces!!). I also realized that not only does a light fixture make a statement but so does the furnishings and in this section I am researching the home bar. With the wine culture taking the market by storm, it is only natural to have a bar area that suits your home and decor. If you have the rustic or simplistic look in your home why not add a bar area? Below are some awesome ideas I have found that I thought would work well even if all you have is a corner. Add some cool and eclectic pieces to express your personality and for fun. They can be used indoors or outdoors, and would add some rustic charm to any bar area or even to the kitchen counter island if you love this style and wish to carry it through the kitchen as well. I love the reclaimed barn wood on these stools and up against the brick wall they really do look awesome. The backs are metal and would work indoors or outdoors. I love that they are not too bulky and would not take up much space. Instead of an actual bar like you would see in the basement of that 70s era, you could go for a simple bar cart. These work especially if your space is smaller but you want a place for your wine, spirits and glasses that you can also use as part of your decor. This bar cart is on wheels making it mobile to bring the goodies to you and your guests and can be put away when not in use. But with the rustic styling I think it can be apart of your decor. Why hide anything? If you can afford the room, you could combine dishes with the bar. As you can see in the buffet unit above, one side is for the wine glasses and the bottles. It has a very rustic styling and can take the pressure off the kitchen for storage and yet looks rustic enough for any decor. This one is my favourite! It is advertised as a TV stand, book shelf but also a bar cabinet and I love the red mixed with the metal and the Cargo words on the one side. If you truly love that rustic industrial look and want a bit of color to add to your room, this would do the trick. 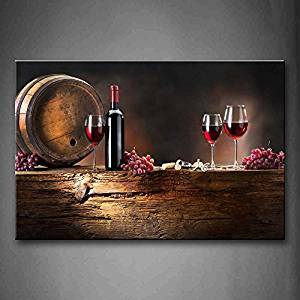 In this case you could simply add a small wine rack or a floor sized model if this is your drink of choice or if you collect wine and would love to display it. You can have all your older vintage wines out with your industrial style decor. I found a few that could get the ideas flowing below! If you collect a lot of wine bottles or receive them for gifts, this rustic wine rack would take up vertical space but not a lot of floor space. It is not heavy looking and you can see the bottles which in themselves are decor. If you can afford the wall space, this is almost like a piece of art in my mind and is my favorite of the ones I have seen online so far. It has been created from a reclaimed wine barrel, which is fitting for displaying your wine and spirits. This wall mounted metal wine rack would be great for that small space. You can get the bottles and the glasses off the counter and out of the kitchen. Wine glasses are quite shapely these days and are hard to store in the kitchen cabinets, so having a place to hang them works well. Also you can store the wine corks in this rack too! This one is under 50 bucks making it an affordable addition or gift idea. This wrought iron wine rack holds 9 bottles and I love how you put them on display just like you would artwork. The best part about the rustic look is that nothing is to be hidden. Everything has a double duty and it can be an affordable way to decorate without the stress of having everything match. If you have the room and wish to carry this theme into permanent fixtures there are tons of options out there on the market. I came across a few things but found this corner sink especially cool. Check it out! This has all the modern plumbing with the old world look. This could be used for a bathroom vanity sink as well as a bar sink. The sink is copper and they have used an old wine barrel. This is truly an authentic look! If you truly want to carry the rustic and old world styling into your bar and wine storage, then check out this ultimate in wine refrigerator! 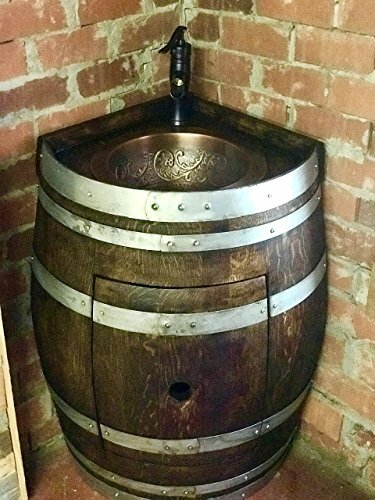 It is a bit of an investment but seriously, it is a wine barrel style and the upper area is set up for you to pour your wine. So if you home and bar are industrial style and you are also a wine lover, this would fit right in! If you have a wine or bar area and want to decorate it, or simply want something a bit more personal that fits in with your rustic style, I came across these distressed bits of wood designed to look like wine barrel lids. I hope so. I know I am. Even if your space is small you can create a bar area for you and your guests. Whether you go with a simple wine rack on the wall or a cart or a full on bar, it is the perfect way to get the wine and glasses and spirits out of your precious kitchen cabinet space and out on display. The bar stools could also double as counter stools. There are so many cool rustic old world designs that I have found online. This has got me excited because I don't see as much of this decor in traditional stores. Some have attempted it but usually you end up at flea markets to get what you want then you have to up cycle it, which is great if you are handy, but with light fixtures this can be dangerous. For me, Amazon carries a huge lineup of industrial style accessories and furnishings to create the right style for you. Industrial can be simple lines of metal and wood and can be created even in modern homes. You don't have to have the exposed brick walls to carry off the industrial look. You can simply have white walls or add faux brick wallpaper to create the look you want. The images in wallpaper have come a long way and are truly realistic as well as curtains and window coverings. So if you have a few minutes and are looking for some industrial ideas for your space, then check out more of my pages as this look is one of my favorite.